“A lot of it is, he is patrician. He just is. He has lived a charmed life… It is a big challenge that he has connecting to folks who haven’t swum in the same rarefied waters that he has.” A former aide, quoted in The Real Romney. I’ve now read two accounts of the personal and political life of Mitt Romney (the other being Mitt Romney: An Inside Look at the Man and His Politics by R. B. Scott) – adding up to some 693 pages – and yet I feel like the singer in Randy Travis’s song, “Good Intentions.” No matter now good my intentions are, I’ve not had any luck in finding out exactly who Mitt Romney is, in head or in heart. I’m beginning to wonder if his biographers wind up with the same frustrated feeling. The team of Kranish and Helman, seasoned reporters for The Boston Globe, covered Romney as the governor of Massachusetts for four years; therefore, they have some background on the subject. And the 400-plus page account that they’ve fashioned seems impressive – with annotations and a fine index – until it dawns on the reader that the subject of the book remains more of a specter than a human being. Specter: something that haunts or perturbs the mind (Merriam-Webster). What Kranish-Helman do well, fanatically well, is to provide a “fair and balanced” approach. There’s almost a mathematical precision to their balancing of “good” Mitt versus “bad” Mitt stories. Let them provide a couple of examples in which Romney did admirable work based on his Mormonism, and they’re quickly followed by two stories of when he allegedly acted uncharitably – and perhaps heartlessly – toward two Mormon women facing personal struggles. And when it comes to his work with Bain Capital, the stories of Romney’s “good” venture capitalism are quickly cancelled out by an equal number of tales of his practice of “bad” vulture capitalism. “The goal of the investor in Bain Capital is to make absolute returns. When they do well, Bain does well. When Bain does well, they do well. It is essentially capitalism at its finest – and its worst.” Howard Anderson, MIT professor and former Bain investor. It all seems to verify the accounts that Romney is only “the real Romney” when he’s practicing his Mormon faith. However, since that’s not something he’s comfortable either talking about or dealing with in public, it means that the person he is – or may be – remains hidden. In reading The Real Romney, an image comes to mind of the presidential candidate dressed in a Zorro-style costume – a man who wears a mask that’s never removed, and which never slides down for even an instant. “After all the weeks and months of that campaign, if you ask, ‘Why did Mitt Romney run for (the) U. S. Senate, and what did he stand for?’ most people had no clue.” Mitt Romney, speaking about himself, as quoted by a fellow party member. 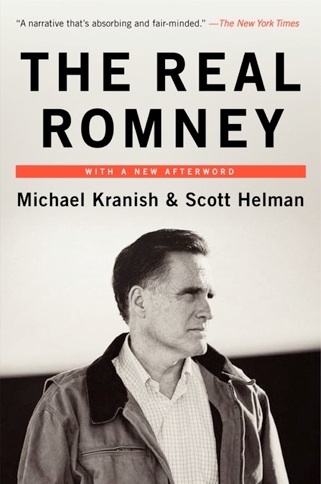 There are entertaining sections in this nonfiction read, most notably those involving Romney’s seemingly foolish run against Ted Kennedy for the U. S. Senate (a race that Romney thought he had a chance of winning until the pre- and post-debate polls came out) and the details of his single term as governor. The reporters also do an admirable job of explaining how Mitt’s life is almost an exact re-run of his father George’s life – both were elected as governor of a state at the age of 55, both were successful businessmen, and both ran for president. In this respect, Mitt Romney sounds very much like Al Gore, who was raised to accomplish the things that his senator father had not been able to. Yet, it’s never clear in this account if Mitt Romney has the fire in his belly that will make him settle for nothing less than the presidency. Unless you’re the ultimate political junkie, there’s just not enough here to justify reading 450 or so pages to find out that the mask, the invisible wall, never comes down. The question simply changes from, “Who was Mitt Romney?” (past tense) to “Who is Mitt Romney?” Based on The Real Romney (and on the book by R. B. Scott, a cousin of Romney’s), it remains a fully unanswered question. I suppose it’s just me but I simply could not relate to this story. It may well be me as I’ve read so many positive comments about this author (Anne Rivers Siddons) and also heard good things from friends and fellow readers. The story certainly started off as cute with a prologue involving the main character Lily and the cat Silas, as they drive with Lily’s husband Carl’s ashes out on the road, on a journey. Siddons’ writing seems to be more real when she describes nature or places or scenes than people. “We sank down in the velvety moss… It was sun warmed… the warmth was soothing… Sleep came as it does outdoors: the sun hammered down on you, sounds faded out… and then all sound was gone.” I have, of course, no way to judge this type of scene being a west coast resident who has never slept on (on top of or in?) moss – and never slept outdoors in the daytime. Let me put it another way. I desperately wanted to climb up the hill that constituted this story but I found no toe holds, nor even places for my hands to grab. Reading should not be this difficult, so – in the words of Joni Mitchell – when the hopes got so slim I just resigned. It may be that Siddons – in her childhood and/or adulthood – has inhabited a world of privilege that is so genteel I simply cannot relate to it. Maybe that’s it, exactly. Or maybe it’s just me. It’s probably me. Thank you to Hachette Books for the review copy.